Drive through anything with LED headlamps and taillamps that provide unbeatable illumination and an unforgettable appearance. With 33-inch tires, stronger axle tubes, bigger brakes, rugged steel skid plates, and more…the Wrangler can tackle anything. Enjoy more comfort, more storage, more visibility, and a quieter ride. State-of-the-art technology allows for innovative features, improved convenience, and precise technical details. Ask about premium safety features such as ParkSense®, Rear Park Assist®, Blind Spot Monitoring®, and Rear Cross Path Detection®. Make your Jeep Wrangler as unique as you are! 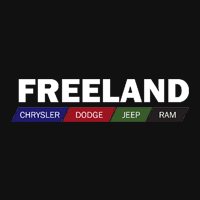 Freeland Jeep can customize your Jeep Wrangler and make it truly unique!